The Taliban, usually quick to claim attacks, issued a statement declaring its responsibility 14 hours after the assault began. At least two senior Afghan officials said the country’s intelligence agency had reports that the Haqqani Network, a brutal arm of the Taliban, had planned the violence. Insurgents armed with grenades and firearms stormed the hotel around 9 p.m. on Saturday, setting off an explosion and a fire. Most of the rooms were occupied, with at least 100 guests of the Ministry of Communications and Information Technology staying there for a conference. The attack comes amid intensifying violence around the country. In the northern province of Balkh, which has been at the center of a recent political showdown with the central government, at least 18 people were killed in an attack by the Taliban late Saturday, most of them members of the local police force, officials there said. Sarajuddin Abed, the governor of Sholgara district, which includes the site of that assault, said that initial information suggested members of the local police had been poisoned before they were attacked, but that the incident was still under investigation. In Kabul, helicopters and drones circled above the hotel for hours while guests hid inside, many cowering under beds or in toilet stalls. Television footage showed guests trying to climb out of windows with the help of makeshift ropes. A man trying to escape from the hotel. Another guest, Abdul Rauf, 48, said he had run through the halls of the hotel as an armed man was firing. This is not the first time a popular hotel has been the target of an attack in a city that increasingly feels barricaded with blast walls that grow ever taller. 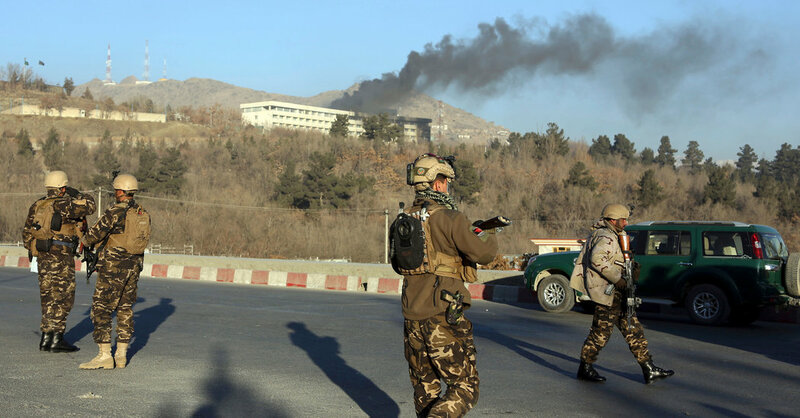 The Intercontinental Hotel was attacked by insurgents in 2011; 21 people were killed, including nine assailants, and many others wounded before the Afghan authorities, with substantial assistance from international military forces, managed to bring an end to the violence. In 2015, the Park Palace hotel in downtown Kabul was attacked, killing at least 15 people, including one American. Soon after sunrise on Sunday, there were glimmers of hope in the capital. Mr. Rauf told a reporter that the authorities had reached his room and taken him to a safe area they had set up on the first floor, where he joined 30 other guests while security operations continued throughout the building. “We tried to proceed with caution to avoid harming guests who hid in the rooms and locked the doors against the attackers,” said Maj. Gen. Afzal Aman, commander of the Kabul Garrison, which is responsible for security in the capital. Mukhtar, 50, an Afghan who uses only one name, spent the night on the street outside the hotel, repeatedly calling his 24-year-old son, Zaiurahman, who works inside as a security guard. He got no answer until shortly after sunrise on Sunday.